This is a math adaption of the World Cafe, which according to its website is “a powerful social technology for engaging people in coverasations that matter”. I recommend reading their website for a complete description. The World Cafe also has an extensive online community that can be found here. I have authored several posts about my experiences implementing it in a math class, which can be found there. As far as I know, I am the only person implementing this in a math class. For the World Cafe you put desks in groups of four, and cover the desks with butcher paper, which I call the table cloth. The butcher paper is like their scratch paper, and they should be doing all the problems on it. Once they have finished working on the problem, they discuss with eachother about what answer is correct. Once they have decided on a correct answer, they must write it, along with all the steps, onto their World Cafe Menu. 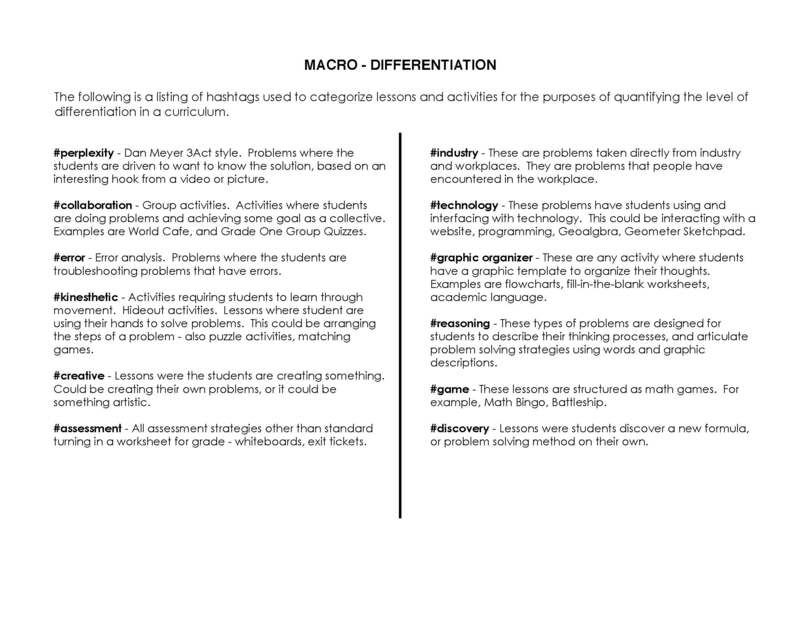 Each problem is one round, and at the end of each round, all students must get up and go to a different table. They are not allowed to follow the same people table to table, they must randomly disperse. At the beginning of each round I give them a minute or so to introduce themselves to their new group, and I make them write their group members names on their menu. – The actual World Cafe has a table host, but I do not use a host in my classes. – Make sure that the students write the names of each of there group members in their own writing – passing the menu around for others to sign is not allowed. – I give the students a two minute warning by playing my harmonica. And then I play it again when it’s time to switch seats. Maybe you can use music or something if you don’t play an instrument. – Students should be allowed to doodle on the butcher paper. – When you don’t give students colored markers, they tend to doodle less and they do more math. So I don’t they them colored markers. – Only final draft work hits the menu, and only right answers get credit. I tell the students that I do not want to see eraser marks on the menu, that should all be done on the butcher paper. Telling them I only accept correct answers provides motivation for them to figure out each problem. – I through in extra credit for my favorite menus. I have students take them home and turn them in the next day. 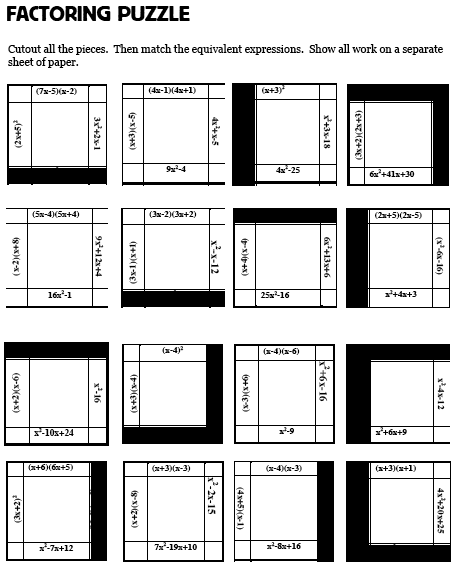 Teach/Pair/Share is my structured version of a pair/share. It is structured more formally that the regular pair/share in that I have to be prepared to do the Teach/Pair/Share, whereas I can just have students do a pair/share at anytime without slide preparation. 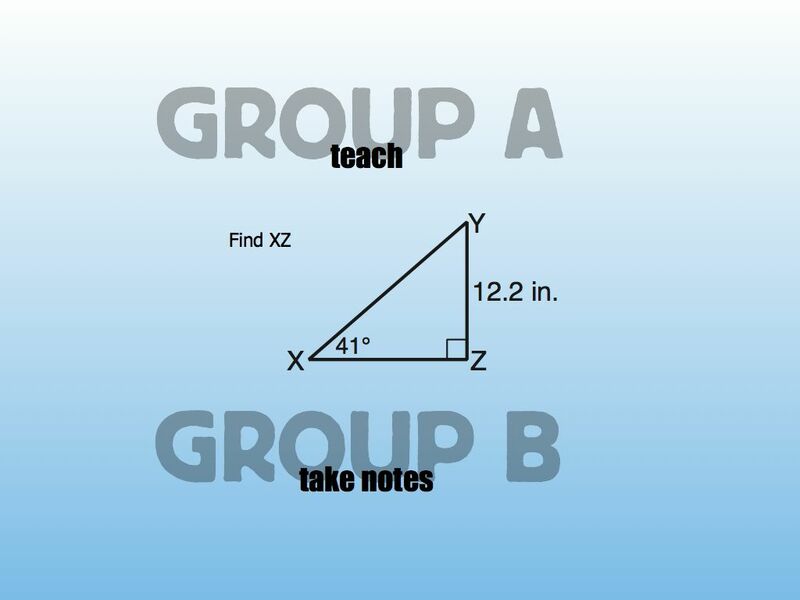 The Teach/Pair/Share fits into #reasoning because it requires the students from group A to teach those in group B. 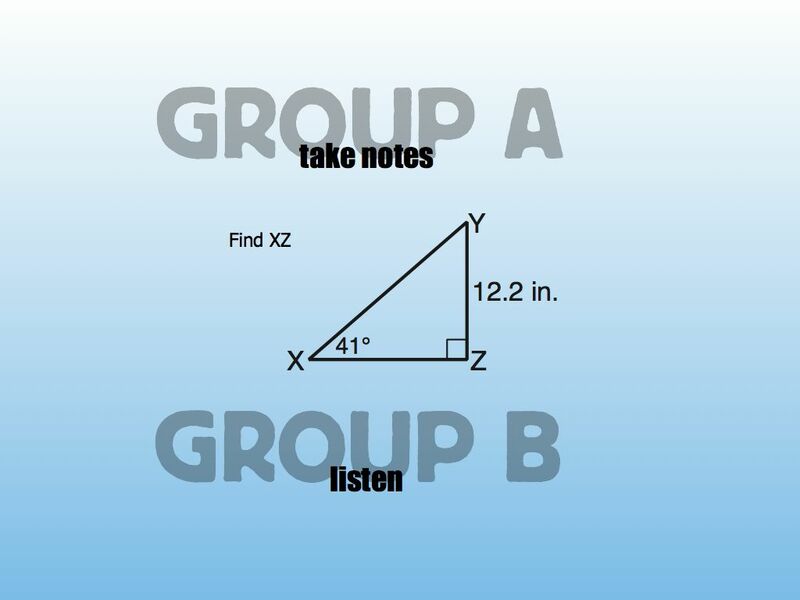 For the Teach/Pair/Share I have make sure each student has a partner, put those rows closer together, one row is group A, the other is group B.
Intially I will have one of the groups take notes, say group A, and the instruction for group B will be to listen. I tell group B to just listen – and I make sure they do not have a pencil in their hand, because I do not want them writing anything. Then I have group A take notes and help me solve the problem. Once we have the whole problem on the whiteboard, I erase it, and switch the slide. Now it is time for group A to teach group B, and for group B to take notes on what group A is telling them. It is critical to be circulating at this point. 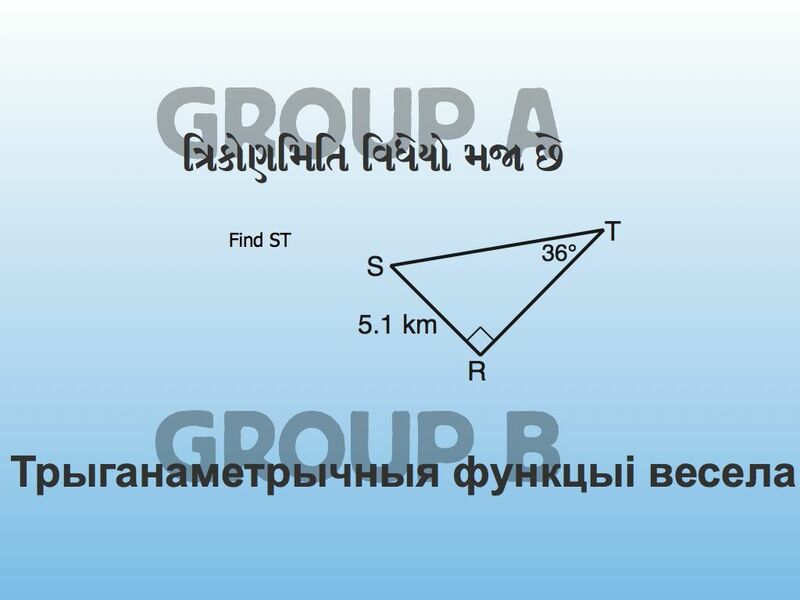 Randomly choose a group and ask the student in group B how to do the problem. If they explain it correctly, thank the group A students for great teaching, and the group B student for great learning. Now repeat the same steps with jobs reversed. At the end I have one problem that everyone needs to do. I typically google translate the instructions into a language no one knows, and then I act upset when the students do not initially know what to do. – The day before I give the students a problem to do on an exit ticket. Then I look through those tickets for a common mistake, and scan that students work into my slides (student names redacted). 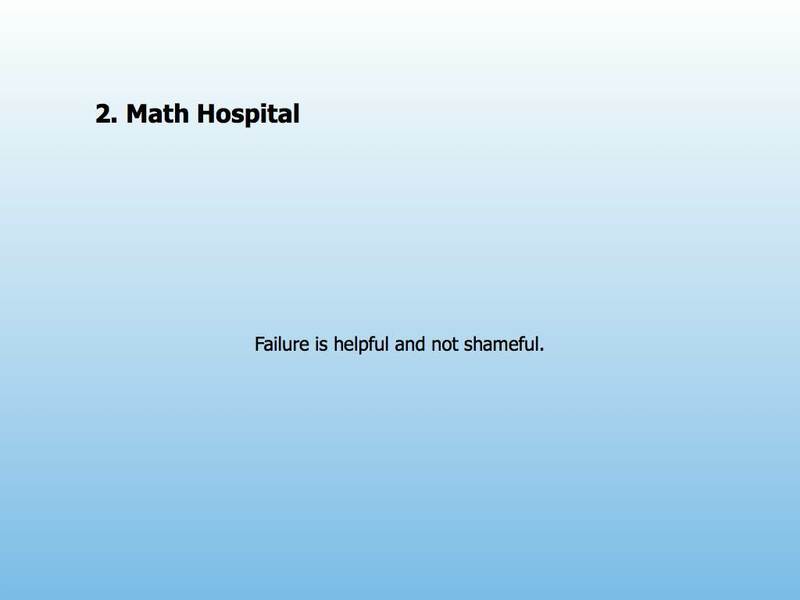 – The Initial slide for Math Hospital is always a reminder of the theme of Math Hospital – failure is helpful and not shameful. I took that theme from a Dan Meyer post you can find here. This is where I remind students that getting things wrong is a great opportunity to learn. – Each student gets one exit ticket to do their work on. – The 1st part of Math Hospital is called “Reading” and is simply where I ask a couple students to read the problem out loud. It’s good that the class hears how other people interpret math language. – The 2nd part is where we talk about things we like about the problem. 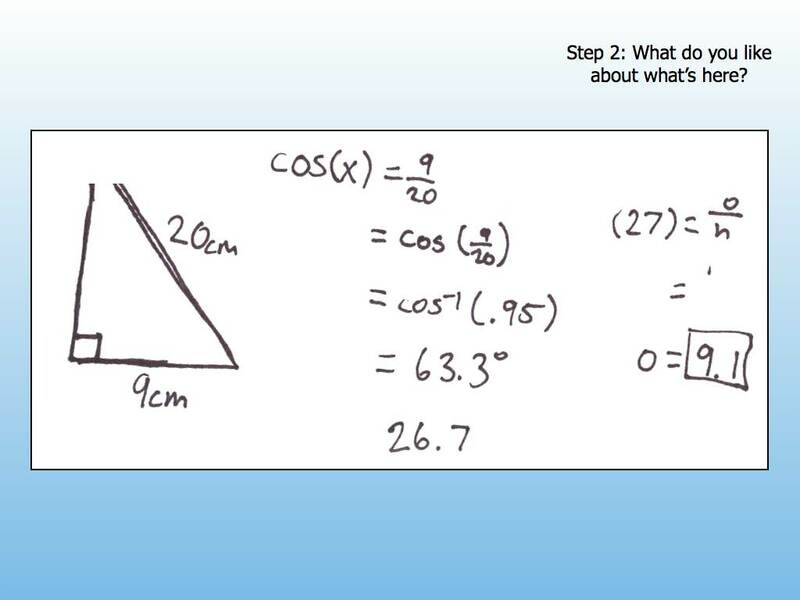 Common answers are asthetic things – equal signs lined up, etc. I tell the students here that “you have been in math for 10 years, you should develop a taste about what you think is good or not good. Imagine if you were painting for 10 years, you would have an opinion about what makes good art”. I have them all write down one thing that they like. – The 3rd part is where we talk about things that are correct. This is where I always say “remember, in every wrong answer, there is always something right about it”. I have them all write down one thing that was correct about the problem. – The 4th part is where we discuss what went wrong, and what corrections need to be made. I have them all write down one thing that was wrong about the problem. – The last part is where we discuss key points. “What can we take from this problem, that is going to help us when we take the test?”. I have them all write down one key point. 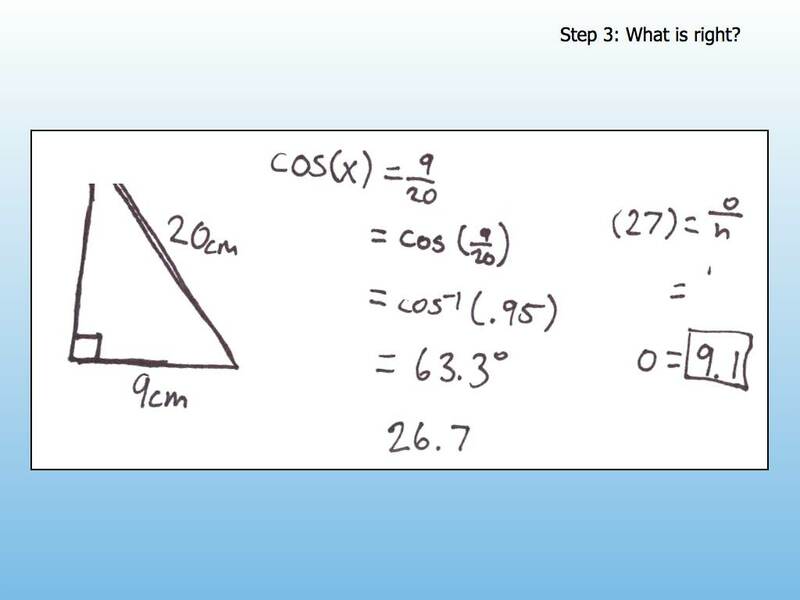 – After the Math Hospital is finished, I have the students work a similar problem to what they just analyzed. I have them do it on the back of the exit ticket. – Lastly I tell them that if they are still confused then they might want to consult another physician. In this case the other physician is Salman Khan, and I show a slide that highlights the exact videos on Khan Academy that cover the topic we were discussing. 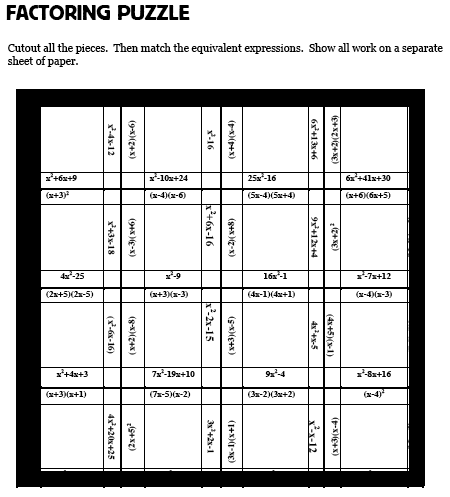 Here is the handout that I give each student the first time we do the Math Hospital. It is basically the same as what my instructional coach had given me, but since I did not have it digital, I recreated it. – I recommend repeating the purpose of Math Hospital everytime you do it. I always go back to the theme “failure is helpful and not shameful” and I always during the second round I say “you’ve all done this problem, what about this work could you say ‘yeah I appreciate that’, or ‘I would not have thought of that'”. – This is really meant to be a 15 minute activity. Quick error analysis. I remixed this a little bit, that post can be see here. 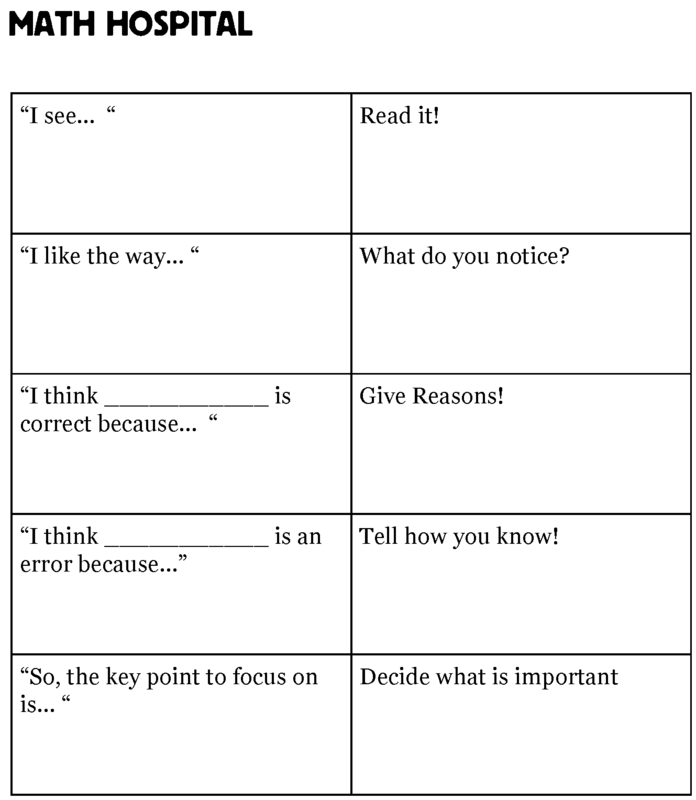 I now give each student a copy of the patient so they can circle and point to things that are right or wrong, that they like or dislike. If I do this at the end of the class, I can now say “make sure this patient is healthy by tomorrow” and use it as a homework problem.